This offseason, NFL Network has been counting down the Top 100 Players of 2013. The network claims that the list is voted upon by the players, which, in a way, is true. Not all players vote, and those that do only select their Top 20 players. As a result, the rankings are often ludicrous. But the network—or the players, if you believe they really compiled the list—did get it right by placing Denver Broncos quarterback Peyton Manning and outside linebacker Von Miller in the Top 10 of the rankings. 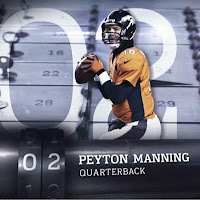 The final rankings were revealed on the network on Thursday evening, with Manning coming in at No. 2 and Miller coming in at No. 9. The top spot was claimed by Minnesota Vikings running back Adrian Peterson. Manning was the highest-ranked quarterback on the list, but San Francisco 49ers pass-rusher Aldon Smith was ranked two spots ahead of Miller, coming in at No. 7. Smith has recorded 3.3 more sacks than Miller since they both entered the league in 2011, but ranking him above Von is outrageous. Miller excels both against the run and as a pass-rusher, while Smith is merely a pass-rusher who struggles mightily against the run. Miller can also drop into coverage, something Smith rarely does. Some of the first plays in the highlights below feature several of Miller's exceptional tackles against the run (be warned that the music is NSFW). Ranking Houston Texans star defensive lineman J.J. Watt at No. 5 is justifiable; Watt is indisputably the best defender in the NFL. Smith, on the other hand, saw his production slide when teammate Justin Smith—who requires double-team blocking—went down with an injury last season. Right now, Miller is a more complete player and a better outside linebacker (the 49ers list Smith as an outside linebacker, even though he truly is just a pass-rushing defensive end). Beyond Manning and Miller, the Broncos had three other players included in NFLN's Top 100 series. Wide receiver Wes Welker came in at No. 44, cornerback Champ Bailey came in at No. 53, and wide receiver Demaryius Thomas came in at No. 68. Left tackle Ryan Clady, who allowed just one sack last season, was unranked. Clady handled it well—"I think I will live," he posted on his official Facebook page. At the end of the day, these rankings mean little. But in June, there's not much more to talk about. So talk—comment, rather—away! Do you agree with the rankings? Complete list here.